The sauna has evolved and proliferated, becoming a staple in hotels, gyms and spas. And now, thanks to increasingly sophisticated technology, it is also fast becoming the bathroom accessory du jour. "There's been a general trend over the last few years for creating more of a spa-like feel in the home," Ruth Bell, deputy editor of Kitchens Bedrooms & Bathrooms magazine, says. "The desire for relaxation and to get away from the outside world fits in with the need to create a haven in the home. And in particular, a sauna/steam room is a place where you can just be on your own and really get away from it all. And with a one-off outlay rather than an annual membership, it makes financial sense too." David Taylor, from Leeds, sales director of a hotel chain, couldn't agree more: "I've got a fairly stressful job," he says. "I'm director of a company that owns 18 spas so I'm familiar with saunas and the benefits that they bring. But I'd never thought about having one at home, but then a colleague told me about the recent advances in technology, which sparked me to think about a sauna as a domestic product. And after a bit of Googling, I found Divapor.com." Taylor spent about £2,000 on his two-person infrared sauna, and set it up in his home office. "My 11-year-old son and I assembled it in less than an hour, and then you just plug it in and you're away." So how do the family enjoy it? "I don't let them use it. They know it's my little sanctuary, where I go two or three times a week to sit with a book or to listen to music - it's got a CD player. I read the papers every Sunday morning in there. It's just a great way to chill out. And during the winter months, they're obviously very warming and great for lifting the mood and spirit." 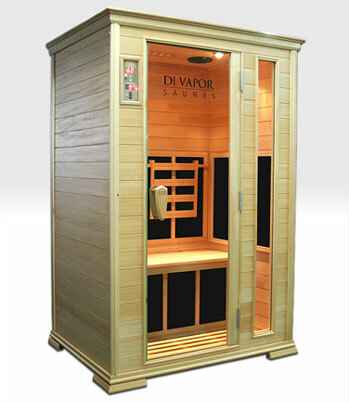 Taylor chose an infrared sauna because it seemed more convenient. He also prefers the type of heat it generates, which relies on carbon panels, rather than raising the air temperature excessively, meaning a lower heat does the job. "You'd think it would be quite power-hungry but it's not," he says. "It's made virtually no impact on my electricity bill."